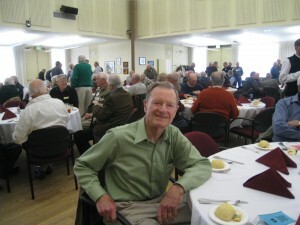 On Tuesday March 9, 2010, Michael and Jean-Marie were the guest speakers at a luncheon of the Sons in Retirement, Branch 92, in Santa Rosa, CA. The event started at noon at the Berger Community Center at 6633 Oakmont Drive in the Oakmont Village Retirement Community. Marshall Johnson, who used to work with Jean-Marie at HP/Agilent Technologies in Sonoma County, came to the Berger Center to hear her story again. Marshall has been an avid supporter of our book and the Faggiano family story. Jean-Marie tells her story to the crowd of over one hundred retirees. 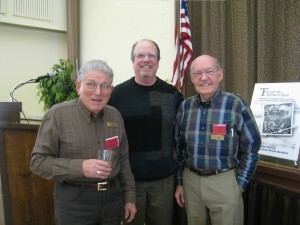 From left to right: George Callori, Michael McCoy, Gene Wilson. Sons In Retirement (SIR) is a non-profit public benefit corporation for retired men. SIR assists men in renewing old friendships and making new friends through SIR activities. 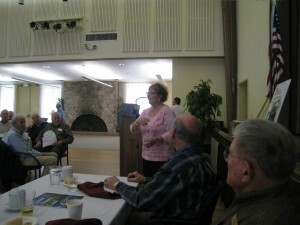 Sons in Retirement has more than 20,000 members in 150 Branches throughout northern California, from Bakersfield to the Oregon border and Lake Tahoe to the Pacific Ocean.